Select the paragraphs you want to change, or press Ctrl+A to select everything. Choose 1 for single spacing, or 2 for double spacing. 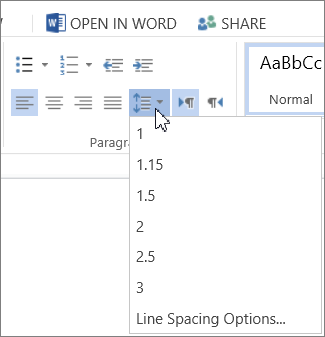 Tip: If you want to change the spacing before or after the selected paragraphs, click Line Spacing Options at the bottom of the menu, and then click the arrows in the Before or After boxes.